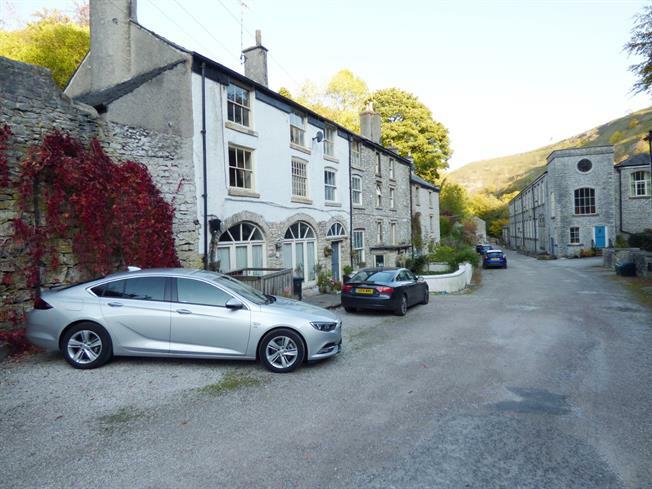 2 Bedroom Flat For Sale in Buxton for Asking Price £150,000. Benefitting from ground floor access but an upper floor position within the development this charming two bedroom flat also offers two terraces, pleasant views, outbuildings and parking. A side entry gate leads to two storage buildings and the main entry into the flat which opens into a spacious living room, off which is the kitchen and access into the two bedrooms and a small lobby from which you access the bathroom and the utility cupboard. Whilst leasehold there is only a nominal ground rent of 1 per annum and there are 957 years remaining of the original 999 year lease. A gated entry, the initial section being shared with the property below to allow access to its outbuilding. The entry is an open air one with a porch overhang at the main access point to the flat. Access to both a storage cupboard and the outbuilding is also from this entry area. Single glazed window facing the front and a radiator. Single glazed window facing the front, fitted wardrobes and a radiator. Doors to the utility cupboard and the bathroom. Comprising a panelled bath with mixer tap and shower attachment, a pedestal wash hand basin and a close coupled WC. A double glazed uPVC window with frosted glass facing the rear, a radiator and part tiled walls. Plumbed for a washing machine and a shelf suitable for a small compact freezer if required. A useful additional space adjacent to the initial outbuilding. Used currently for general storage. The property has designated parking at the front of the main building and also benefits from a lower terrace and an upper terrace with a very pleasant aspect and which also houses the oil tank. There are a series of surrounding herbaceous beds and access to the lower terrace in particular is very simple.